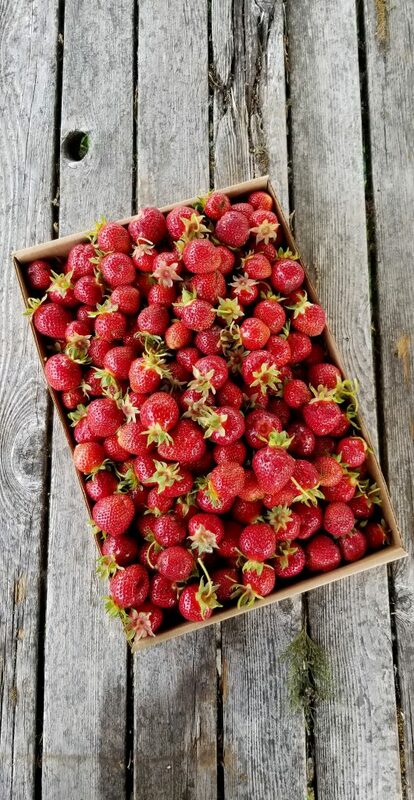 Well, strawberry season has recently just begun up here in Washington and whenever u-pick season starts I always go a little overboard. You only get a few short weeks a year to gather the most delicious fresh local produce. So what if you single handedly picked enough berries to feed a family of twelve, have you never heard of preserving? That’s what summer is all about, canning, freezing, dehydrating, and of course making your own fruit leather! One of the reasons that fruit leather is so delicious is because the natural sweetness of the fruit is concentrated. With the water removed and the little bit of heat the sugars get a chance to develop and feel just like that sweet treat you had as a child. Only this time you know exactly what it is made out of. Fruit leather is such a great treat to make when you have an abundance of produce. Because fruits are very hydrating, you need a lot of fruit pulp to work with to make leather after removing the water. 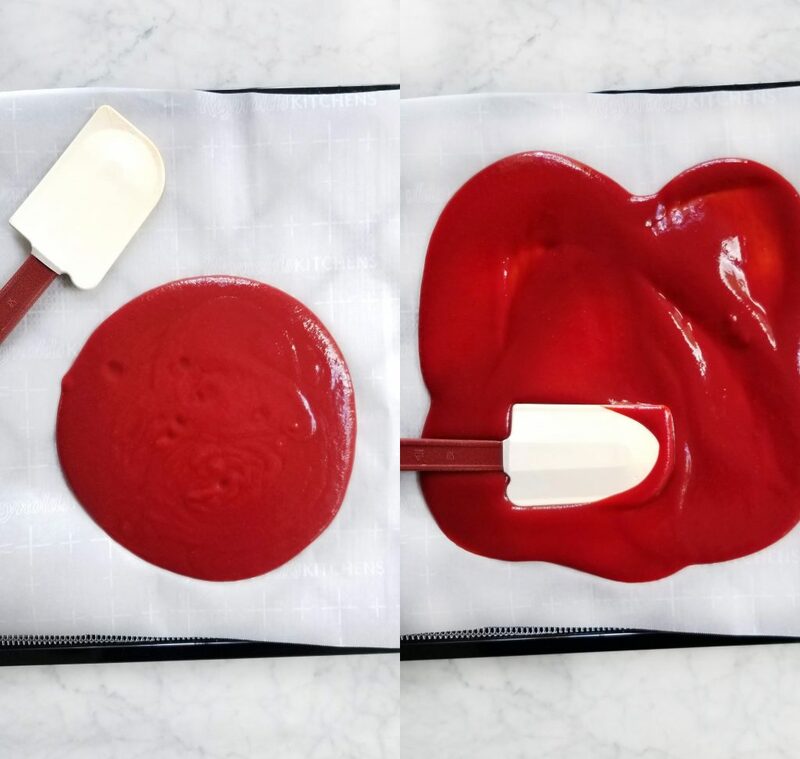 So if you have a friend with a cherry tree, a neighbor with plums, or go a little crazy at the local u-pick berry farm, consider fruit leather to be one of your outlets. Fruit leather as a whole is pretty simple you need a good amount of washed, peeled, and pitted fruit that can be mashed and cooked down with a sweetener (I choose golden raisins) and a little bit of acid (I chose balsamic vinegar). You can also blend the contents to make it smoother. Once the contents are cooked down to a slightly thick consistency you can evenly pour the contents out onto a lined jellyroll pan (or dehydrator sheet lined with parchment). Set your oven to a low temperature (170 degrees seems to work), and let it cook for 3-5 hours. In a dehydrator set it to 135 degrees for 8 hours, the finished product should be shiny but not sticky to touch. 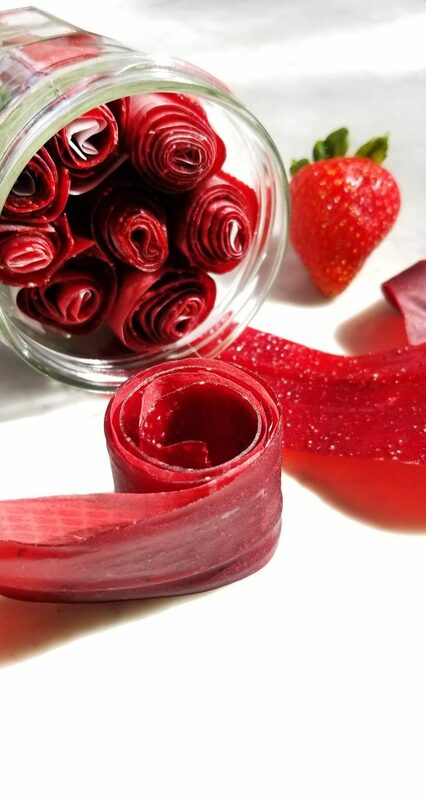 Most fruit leather recipes call for the addition of cane sugar and acid to make the fruit sweeter and bright. Honestly if the fruit is ripe, it should be sweet enough. 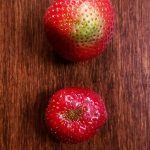 This particular recipe utilizes golden raisins to balance the acidic nature of these beautiful strawberries. And instead of lemon juice, I wanted to add and acid with a little more depth. You can use any balsamic vinegar that you like but I particularly love using thick fruit balsamic vinegar’s( like cherry, peach, mango, or berry). I normally reserve these for drizzling onto my desserts but they are such a lovely addition to these fresh strawberries. 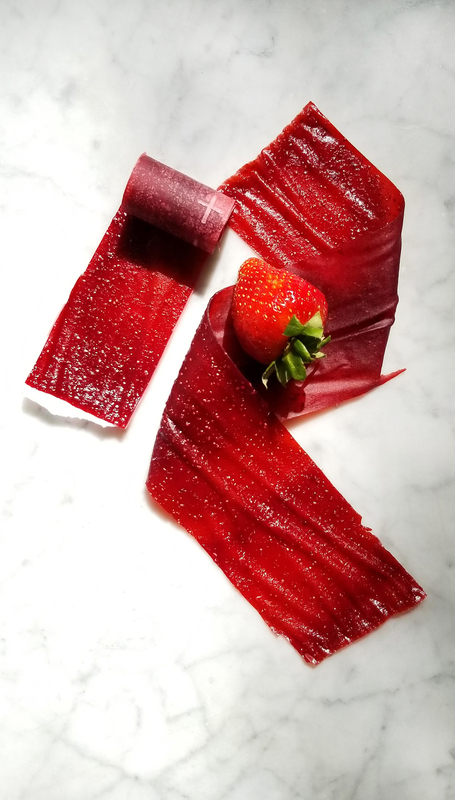 I personally like making fruit leather in my dehydrator because it gives me space to make multiple sheets, but these can just as easily be made in your oven. I hope you get a chance to make this recipe and enjoy a nutritious snack that will make you feel like a kid again! Healthy homemade treat that reminds you of your favorite childhood snack. Great for lunchboxes, hiking, or dessert! Place the mixture into a blender or food processor and blender until just smooth, enough to break down the raisins. Add blended mixture back into the pot. And simmer on low for 10-20 minutes, you want some of the water to evaporate and the mixture to become more like a jammy syrup consistency. Once the mixture has thickened remove from heat and stir in the vinegar. Pour mixture into two parchment lined jelly roll pans (baking sheets with a lip) evenly about 1/8-1/4 inch thick. Bake in oven at 170 degrees for 3-5 hours. When finished the leather should be shiny and not sticky to touch. 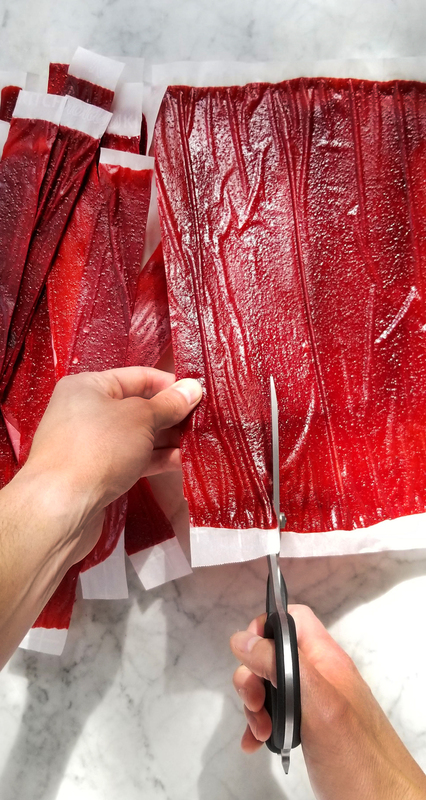 Let the fruit leather cool, then cut it into long strips (including the parchment paper) then roll those strips into rolls. Personally the best way to keep them rolled is with tiny rubber bands. You can also cut the leather into whatever shape you like and store it in an airtight container as a flat treat. Set your dehydrator to 135 degrees.